Philadelphia demonstrators protested earlier moves by Republicans to repeal the Affordable Care Act last February. 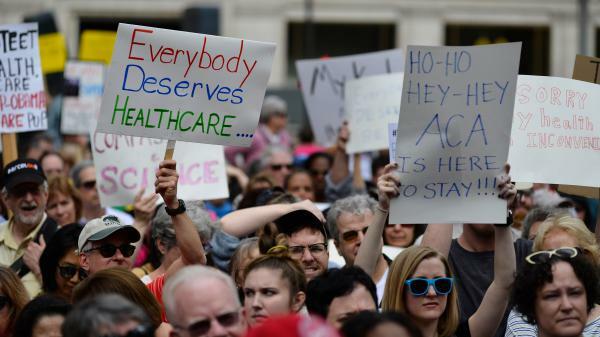 If the ACA is indeed axed as unconstitutional, health policy analysts say, millions of people could lose health coverage, and many aspects of Medicare and Medicaid would change dramatically. If last Friday's district court ruling that the Affordable Care Act is unconstitutional were to be upheld, far more than the law's most high-profile provisions would be at stake. In fact, canceling the law in full — as Judge Reed O'Connor in Fort Worth, Texas, ordered in his 55-page decision — could thrust the entire health care system into chaos. O'Connor's decision is a long way from implementation. He still must rule on several other aspects of the suit brought by 18 Republican attorneys general and two GOP governors. And a group of state Democratic attorneys general has promised to appeal O'Connor's decision, which would send it to the 5th Circuit Court of Appeals and, possibly, the U.S. Supreme Court. The high court has rejected two previous efforts, in 2012 and 2015, to find the law unconstitutional. More than 20 million Americans who previously were uninsured gained coverage from 2010 to 2017. Some of that was due to an improving economy, but many also gained the ability to buy their own coverage, thanks to the law's federal subsidies to defray the cost of insurance. Other provisions of the Affordable Care Act played a significant role, including its ban on restrictions for people with pre-existing medical conditions, expansion of the Medicaid program to more low-income adults and allowing adult children to stay on their parents' health plans until reaching age 26. If the law were reversed, federal funding for Medicaid and individual insurance subsidies would stop, and insurers could once again refuse coverage to or charge more for people who have health problems. Gail Wilensky, who ran the Medicare and Medicaid programs under President George H.W. Bush, says such a change "would be very disruptive because so much [of the ACA] has affected the way health care is organized and delivered, and the way insurance is provided." For example, says Rosenbaum, the increase in health coverage meant that "suddenly it became possible for health care systems to care for, by and large, an insured population." Previously many hospitals, doctors and other health providers spent considerable time and effort figuring out how to treat — without going broke —people who lack insurance. After the ACA kicked in, these providers began to worry less about whether they would get paid. And the federal government started pushing them to create new initiatives aimed at improving the quality of care. Those include, for example, measures that base some federal payments on patients' health outcomes rather than on each individual procedure performed. Under the ACA, the government also encouraged strategies that improve health across the U.S. — like improving the availability of healthful food, bicycle paths and preventive care. If millions of people lost insurance, Rosenbaum says, those health providers "would have to go back to wondering how they will be able to pay their bills." The popular Medicare program, which covers an estimated 60 million seniors and people with disabilities, was a major focus of the ACA. Elimination of the federal health law would take away some popular benefits the ACA conferred — everything from free preventive care to the closing of the "doughnut hole" in Medicare's prescription drug coverage. The doughnut hole refers to a coverage gap that had previously exposed large numbers of beneficiaries to thousands of dollars in drug costs. The ACA required states to calculate Medicaid eligibility differently — changing what counts as income — so all the work states did to alter their information systems would have to be recalculated, she says. The ACA's protections for pre-existing conditions — banning insurers from charging people with health problems higher premiums or refusing to sell to them altogether — built on similar protections for people with employer insurance. Congress included those protections in HIPAA, which was enacted in 1996. And far more people are touched by HIPAA than by the ACA, because far more people get health insurance through their employer than through the individual market. However, when Congress wrote the ACA, it incorporated HIPAA safeguards into the pre-existing-condition provision. That means if the ACA is struck down, the HIPAA protections might disappear as well. President Trump has railed against the health law, but his Department of Health and Human Services has a priority list that relies in some significant ways on the continued existence of the ACA. For example, efforts to address the opioid epidemic — one of the administration's top health challenges — could be seriously set back if the Medicaid expansion were to end. Medicaid is the largest single payer for mental health and substance abuse treatments. Much of the president's effort to limit drug prices flows through the Center for Medicare & Medicaid Innovation, which was created by the ACA and would lose its legal authority if the law became invalid. Similarly, the administration is using this center to pursue "bundling" payments for certain surgical procedures — an effort to try to get more value for dollars spent. Kaiser Health News, a nonprofit news service, is an editorially independent program of the Kaiser Family Foundation and not affiliated with Kaiser Permanente. KHN senior correspondent Phil Galewitz contributed to this story.